With Adobe Flash 10.1 set to be revealed as part of Android 2.2 during this week's Google I/O show, Adobe has already posted landing sites for the Nexus One and the Motorola DROID. 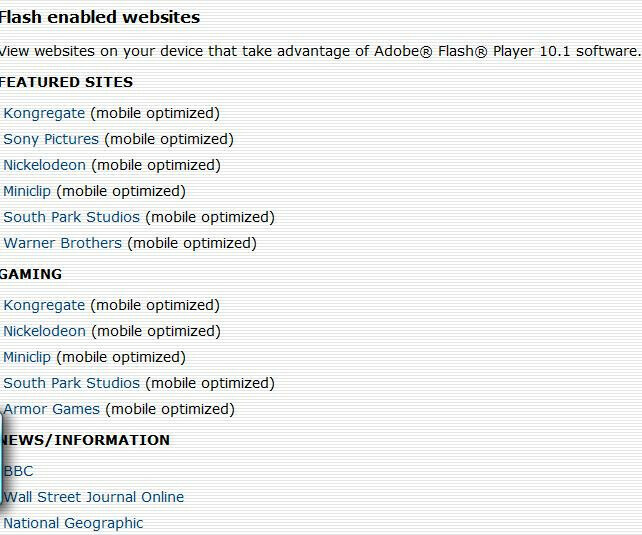 Besides being great news for owners of both devices (it reveals that both devices will be among the first to get Froyo), the sites also reveal a number of Adobe-suggested destinations where owners of Flash 10.1 featured phones can navigate to show off their phones new capabilities. Among the recommended sites are ones produced by Sony, Nickelodeon, South Park Studios and Warner Brothers. What is a little strange is that the lists for the N-One and DROID differ in content. Adobe also listed a site for the Palm Pre and showed a great sense of humor by posting a list for the iPhone. Under the latter, Adobe replaced the link "Get Flash enabled websites" with a "Get apps" link. This, of course, refers to the current Adobe-Apple feud which appears to forever keep Flash off of Apple's iPhone/iPod/iPad. After a phone receives the Flash 10.1 download as part of Android 2.2, the user will receive a link to the appropriate landing site. N-One and DROID owners-betcha can't wait! Whats the difference between Android, Apple, and DC Comics? Apple doesn't have Flash! MuahHaHa! I know, but you have to admit it was funny. This rocks and will open new doors for the faster better phones to rise above the far to long life of the old tech we call the iphone. I want a revolution of new faster stronger longer lasting phones! Droid Rocks! I guess the main advantage of the Motorola DROID over the HTC DROID Incredible is that there is no manufacturer overlay on the Motorola, so it should continue to be one of the first phones getting Android OS updates. That is too bad, since HTC makes much better phones MOTOROLA.